This past summer my sister brought something into my house that I have not been able to stop thinking about. For these past couple months, I have had this thought in the back of my head, "You have got to get your hands on some beets". This is a not a thought that has ever lived in my head before. In fact, last year, I almost had a fit over the amount of beets I told Jamey not to grow... which he then went on to grow.... and we went on to can. The irony is not lost on me. Jamey got the hint and we didn't plant beets this year, so my plans were 1) to ask around to see if any friends had some beets to spare and if that didn't work, 2) I'd head to the farmer's market and buy myself some. When a friend offered me some beets, I graciously accepted and set to work making the biggest batch I could with the ingredients I had on hand. 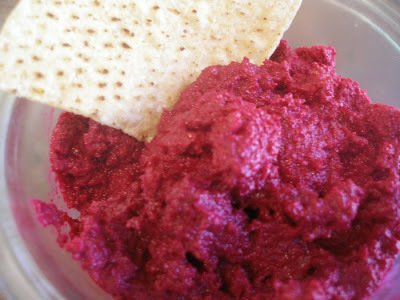 I'm talking about beet hummus. Before you freak out because you think it sounds weird or gross, let me tell you that I love hummus, but don't love beets. I enjoy pickled beets pretty well, but have never really enjoyed plain, cooked beets. They're just a little strange-tasting to me. That's why I was so shocked over how much I wanted to devour the entire container of beet hummus that my sister brought. Instead I had to share it. There are no garbanzo beans in this hummus as there are in a typical hummus recipe. The ingredients are simple- cooked beets, tahini, lemon juice, garlic, cumin, salt and pepper. Despite the lemon juice, this hummus is sweet. It's the beets. And, while the beet taste is there, the cumin, tahini and garlic put it in the back seat, so it's not overwhelming. And the color? It is so pretty. Have you ever been able to say that about any other hummus? I mean, roasted red pepper hummus is cute, but beet hummus? Gorgeous. I made a 14-cup batch and froze it. We've eaten about 5 cups already. Okay, I've eaten about 5 cups already. Jamey's eaten some and he really likes it, but he goes to work every day and I get to stay at home with the beet hummus. Another big batch is in my future- I still have beets in my fridge. Makes about 2 cups. If you have trouble finding tahini or don't want to buy it, you can make it yourself- see here. Eat them with tortilla chips or these yummy pita chips. Cover beets with water in a cooking pot and bring to a boil. Cook them until they are super, super soft (If you pull them out too early, your food processor will have trouble pureeing them). Remove them from the water and let them cool until they can be handled. Slip off the skins and stems. Cube them and place the beets and the remaining ingredients into your food processor and process until smooth. Serve warm or cold or room temperature with tortilla chips or pita wedges. Store, covered, in the refrigerator. It freezes very nicely. I don't care for beets (unless they are in chip form), and I *want* to like beets. So I should try this huh? It doesn't taste like dirt? Funny, I was just wondering about other uses for beets. They are something I know we can grow, but hubby doesn't care for pickled beets and that's the only way I like them. I'll have to give this a try, thanks. I detected no dirt flavor whatsoever:-). oh this is so funny! 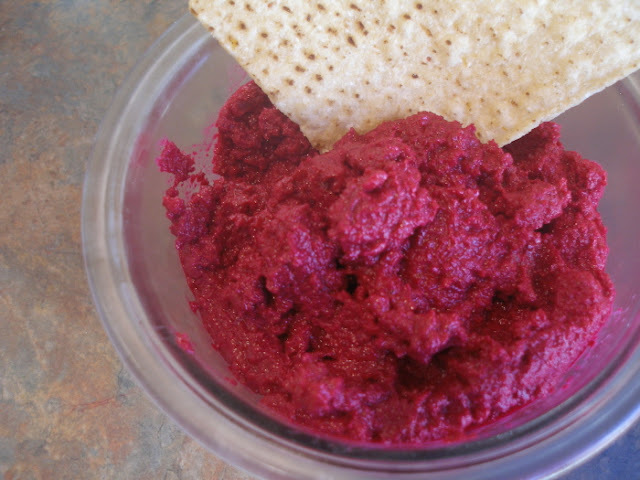 I made beet hummus this summer, because my normal beet cooking methods include lots of heat which is good for winter, not summer. And we were not fans. But the way we LOVE beets (besides pickled), is roasted. Eaten hot or eaten room temp on salads. Yum. This recipe does sound delicious - although truthfully I've only ever had beets canned - I really should try them roasted with the batch I've got almost ready to harvest. Thanks for the recipe - I'll have to give it a try as well (think I should have planted more). Talk about suspense, I could not acess this post until today. The hummus really sounds...well, different but good. How could it not be, I love beets. We really must try making some this winter. Same as Mr. H I couldn't access this post until today either! Anyway, we love beets around here and we also love hummus! We'll have to give it a try some time! I am going to try this! As soon as the roads clear and I can make it to the grocery store to buy some tahini. We bought beets for the first time this weekend and I tried them for the first time. I juiced one and added tons of other veggies and fruit, but it smelled like dirt and I could taste it in the juice. I knew I could count on you for a good recipe for beets!